All right the title is jokey, the thing is the Reformed tradition has subordinate standards. Now don’t go looking in the Westminster Confession, or Belgic or the Statement of Nature, Faith and Order of the United Reformed Church for statements about Subordinate Standards, you won’t find any. The simple reason is this is self referential these are the subordinate standards. That means for all URCs that the principle Subordinate Standard for us is the Statement of Nature, Faith and Order of the United Reformed Church. So saying we don’t have standards is a bit stupid! There is one thing every one should spot I have so far and will continue to do so, use the term Subordinate Standards. They are Subordinate to scripture. The Protestant shout of “Sola Scriptura” means that practically they never ever have been the final statement on the faith. Doctrine can and is Reformed in order to bring it better in line with Scripture. This is alive and kicking in Reformed Churches. I can remember being asked how a hymn of Kathy Galloways could get into Church of Scotland hymn book where it would struggle with its feminist images into an Anglican one. The answer was simple, the images Kathy used were Biblical, therefore the question was not “Are these images feminist?” but “Are these images Biblical?” and if they are then they trump all questions about whether things were feminist or not. Many Subordinate Statements say exactly that. Secondly Subordinate Standards are about where the faith has been. Have a look at Reformed Presbytery of North America’s list and really go down them. You will find an odd bunch of documents. There are the standards such as: the Apostles Creed and the Westminster Confession, but then look what else is there like: Metrical Psalms and the Acts of General Assembly of the Church of Scotland betweeh specific dates! This does not look to me like a group trying to specify Doctrine it looks far more like a list of documents they tell where the group has come from. To ask who we are is nearly always to ask who we have been. The picture I tend to come back to is of cairns, they normally come from places where the originating group for some reasons feels that it is a good idea to make a statement about how they see the faith. The reasons can be various; I am almost certain that the Congregationalists insisted on one when the URC was formed. They did not want any pesky Unitarians getting their hands on any property of the new united church and therefore having a statement was essential (the Unitarians won’t have a statement because that might meanthose troublesome Congregationalist getting their hands on the property). 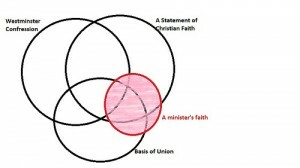 I think it is instructive that the requirement in the United Church of Canada to become a member is that you assent to belief in the Trinity (not the incarnation or ressurection) and this was insisted on by Congregationalists. The memories of fights in church history die hard. However it has to be said that fresh statements at the creation of a merged denomination are common. They equally occur at times of crisis, points of turmoil and not always theological, quite a few of them are political. However most of the time we plod along with those we have got and don’t pay much heed to getting new ones. 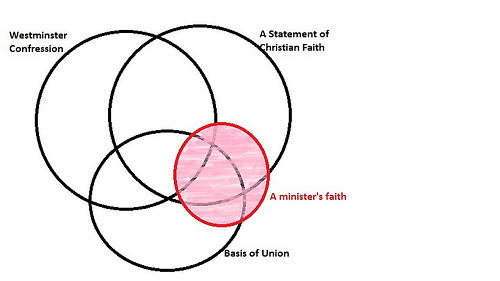 A while ago I drew two pictures of what we would mean if we required a ministers faith to be in substantial agreement with the subordinate standards. I suggested the URC’s approach was like the diagram shown here. I would suspect quite a overlap with the Basis of Union, maybe with quite a bit of agnosticism about parts of it, with other bits being inconcurrence with other Subordinate Standards which we accept. In other words the tradition is defined by having a broad scope with many overlapping subordinate standards and the requirement is that the faith falls mainly within those parameters. It does not mean that all ministers sign up to the same things exactly. Indeed although I have shown three here, there are at least another six named subordinate standards. I defy anyone to know them well enough that they can recall them at an instance and say what they agree and disagree with them let alone accept them all. Then there are the ones we don’t name but are included as “of the tradition” e.g. the Scots Confession. However what status is John Robinsons address to the Pilgrim Fathers at Plymouth. You won’t find it on the internet, I might put it up at some stage if I get hold of it, but the paraphrase in the form of We limit not the Truth of God (ignore the tune) is widely sung in the URC and I have heard quoted in theological debate. There is thus a deliberate ambiguity. Yes I use the subordinate standards, they have been an important vehicle of my initiation into Reformed Theology, but I do not use them in a sort of lets try to believe twenty impossible things before breakfast style. I usually read them through quite quickly the first time, to try to get a feel of them, what is important and how they stand. Then and this is an ongoing process I turn to bits I see as significant and try and work out why. It maybe I disagree with them, in which case I need to work out why, or it might be a phrase gives me cause for reflection, time to look deeper at other understandings. So Subordinate standards are there to say where we have been, not to determine who we are. Remember “Those who cannot remember the past are condemned to repeat it” (George Sanayana) so we need methods of remembering where we have been and knowing why we have travelled to where we are. An incident still annoys me and it is probably ten years since it happened. I was studying Sociology and doing one of the how to courses, which had its bit on ethics and the need to anonymise. One guy did a bit on exploring internet culture and the thing that rankles is that he totally disregarded this advice, so much so I am sure I know and can get in touch with one of his informants. He took a bit of conversation from a chat room. It was a short exchange between two people using nom de plumes. It looked to him as if people were using pen names and therefore he thought he did not need to anonymise. What is more the name was short and not a recognaisable name in any language. Surely this name was not a give-away. It is, it belongs to one specific person who has used it for the best part of twenty years or more. If I see that name anywhere on the internet I assume it is her who typed that. What is more the personna she portrays in the interaction is typical of her personna elsewhere where I do know her. Lets go back to the beginning and to usenet boards and maybe even earlier. Names were limited, the maximum length was eight characters if you were lucky. So you could not have JohnSmith as your name. The challenge in those days was to find an eight letter code that was both memorable and not taken. Once found people tended to stick with it. In a very real sense they developed an ownership of that code. Towards the end of those days a six letters in a search engine would have got you most of my internet activity except work stuff (there it was five). Now you’d have to go down half a page to find something that relates to me as others use that code. However some have stuck with their name or code and some of those are very short.Therefore when people move from forum to forum you can look out for the same names and find the same people. So despite what the social scientists like to think, the internet was never a lot of nameless geeks rampaging around having careless fun. The geeks from fairly early on established a culture that maintained identity across bulletin boards, message boards and discussion rooms. There was no policing except the more codes you used the more names and codes you had to do, sock puppetry (having multiple codes on a single discussion board, was looked down upon). In a stuation where discussion boards appeared and disappeared pretty frequently by doing so people often knew who they were talking to or at least knew what previous interaction they could recall. The go for the spectacular, with heightened stories or crusading for a particular perspective (Kierkegaard the first internet troll?). These draw attention, almost certainly as much suspicious attention as any others. Such people are either unmasked or are asked to leave as they are causing problems. To do it successfully you must keep a low key, everyday persona who is distinct from yourself for long periods of time. Its not easy, imagine trying to write fiction that is as boring to yourself as paint drying and you get some idea of what they have to do. My suspicion is the vast majority of people who try that get bored. What is the point of being , clever if no-one knows about it and if anyone knows then your game is up and you are no longer clever. So when you investigate social behaviour on the internet, please do not fall for the simplistic assumption that pen-names are anonymous. They may be or they may be the way that individual is most widely known. From where does good self image come? I am on holiday staying with close friends, last Sunday morning my friend applied for a job working with alcohol and drug abusers. Her reason for taking it rather than staying with a current job was partly pay, although it is even shorter term than her current one, partly status as it is ‘proper’ social work although it is no more secure than her current job (both have short term contracts) and that means that her clients have to see her. I challenged her on this, my dealings with addicts suggest that it takes lots of self discipline to stay off what you are addicted to. That it is a niggle that wears away at a person. She then made the comment that for most addicts accessing services meant they had to acknowledge their addiction and to do this was to undermine their already poor self esteem. This is wronger than a wrong thing that is mistaken (Erin:Ship-of-fools). The thing is there are two things that build real self esteem in my book and the first has to come first. According to Jurgen Wolff, Brian Tracy when stuck in the desert with a friends and a broken down landrover, faced the first. That is if life is to be worthwhile, it is up to us to take responsibility for what is going on in it at the moment. Not seek to blame but in the same way a treasurer is responsible for a clubs money. Circumstances can be someone-else’s fault and nearly always we are co-creators of them with others, but on the whole the finding of blame is pretty pointless. Rather the question that is useful is “What am I going to do about it?” Doing something to try and improve the situation, in Brian Tracy’s case help fix the Landrover, is the crucial step. It changes one from victim to active player. There is no guarantee of success but you have made failure less likely. It is recorded that most addicts don’t believe they are addicted. They believe they can give it up at any time and because they never try they never fail at that! The fact that the addiction is controlling more and more of their lives is not taken into consideration. They will justify doing it, even telling themselves lies. I have seen it, it is not pretty. Keeping the addiction going becomes a method to avoid dealing with other things. It eventually becomes the overarching organising principle of their lives and in doing so it saps their self esteem. Until someone in this situation faces up to the fact that they are responsible for their lives including their addiction nothing will change. So much as my friend may like to spare them that step until they do, there is no future and there will be no growth in self esteem. The second part is altogether pleasanter and that is to find a non-judgemental accountable community. This is difficult, I suspect that for at least the first few years the person needs daily contact with the community. That is asking a lot of any group of people. It certainly isn’t a one off thing. I suspect that it is not accidental that where such communities have existed they have had religious overtones (from Alcoholics Anonymous “higher power” to Evangelical Christian missions in Russia). The real good news as far as alcoholics go, is that when they are going sober, they often are some of the best and most skilled people at doing this. I do not know whether this is the case for drug users. I do know that other groups such as writers groups and so forth can form a similar function for parts of a persons life. I suspect that for a few individuals of exceptional character the second may not be necessary, but it certainly eases the struggle. Unfortunately if the second happens without the first you can well end up supporting someone’s self delusion. If that is addiction that could well make the situation worse. Please note I am not saying addiction is solely a self-esteem issue, it isn’t. It has many other facets, not least of which is craving, which is almost certainly due to brain chemistry and is very unlike other desires in that it is very close to compulsive. It is a well known saying that “Love is blind” but I say that love is no more blind than I was born in England. Let me put that in context, I am white British, I have pale skin, blue eyes, and brown hair with a reddish tint. I speak with an educated Northern English accent and I was educated in state school. In other words if you met me, you’d assume that was English born and bred. The fact is you would be wrong although English bred. I was born in East London South Africa. In other words first appearance are misleading. So why do I think on first acquaintance love appears blind and yet on closer inspection turns out to be clearer sighted than many more objective standards. Firstly let me be clear, many things closely associated with love are blind, or blinding. Infatuation blinds one, sexual attraction often leads to one over looking faults and admiration can deceive both the admirer and the person admired, idolisation most definitely does. As far as love is mixed in with these there will always be some blindness. However to the extent that this blindness is a matter of deliberately or by emotion overlooking something that is part and parcel of the beloved object, then it also fails as love, because there is that in the beloved that is not loved. Love rather sees clearly. I have a friend, Stephen who has problems with alcohol. Basically he is capable of not drinking, but once he starts drinking he cannot control it. There are reasons why being this way is difficult for him, he comes from a culture where drinking is part of socialising, it is the way he has always relaxed and I suspect he does enjoy it to a certain extent. If you add in the idea common in today’s society that if you don’t drink you are a prude, you get a fairly clear picture what sort of a mess he easily gets himself into. Now Stephen is fussy over his appearance, if there is one thing he is more fond of it is his job. He has a good degree, is affable and a genuine person. In other words for most of the time, he fools most of the people, who don’t think he has a problem. I actually was going out with Stephen when I first realised he had a problem, yes I got him home and safe after that incident. No we did not break up over that, but did a few weeks later at his request. I was becoming a distraction from drinking (he would hate me saying this but I suspect that is the truth). Do I reject Stephen, no I don’t. Do I pretend he doesn’t have problems with alcohol? no that is not an option either. I do keep some space between us, and probably need to be stronger about that, but that is because we have split up and both of us need that space to get our heads sorted. What is clear is that being close to him, caring about him, far from hiding his problems with alcohol made me have to face up to them. To some it might appear I am turning a blind eye to those problems. Particularly the weeks when he came around on a Friday night with a bottle of wine to share, and we talked about life, including his drinking patterns. At that stage both me and his doctor were in damage limitation mode. I suspect if I have refused to have a drink with him it would have set me up in a position where he would not have been honest with me about his struggles and as I was supporting him through them, it was a price I paid, and yes I did not enjoy that wine. I knew what I was doing, I knew in many books it was wrong and yet it seemed the only possible way forward. That is the problem a person from love will often take action which appear to be “blind” when in fact they are very clear sighted. They know the risks and this seems to best path for them and the individual. Their love is not despite the bad things, but including the bad things. I do not like alcoholism, I have lost friends to it, I have seen decent people ruined and that someone I care for is going through it is painful. I will keep trying to help him fight against it, because each small victory is worth it because I care about him. I struggle equally with being honest, I can’t support him, if he starts to presume our friendship is something other than it is. He can’t substitute me for the alcohol nor expect me to pick up the pieces every time. He has to take responsibility for himself. So there are boundaries on what I can do and in the end if the only way to be fair is to walk away I will but that does not stop me caring. So at one level I see more clearly than others, on another at times I act in ways that to someone outside would assume I was blind to the reality. At its core love has the acceptance of who someone is for who they are. It means risking being hurt, when you know there is high chance you will be hurt. 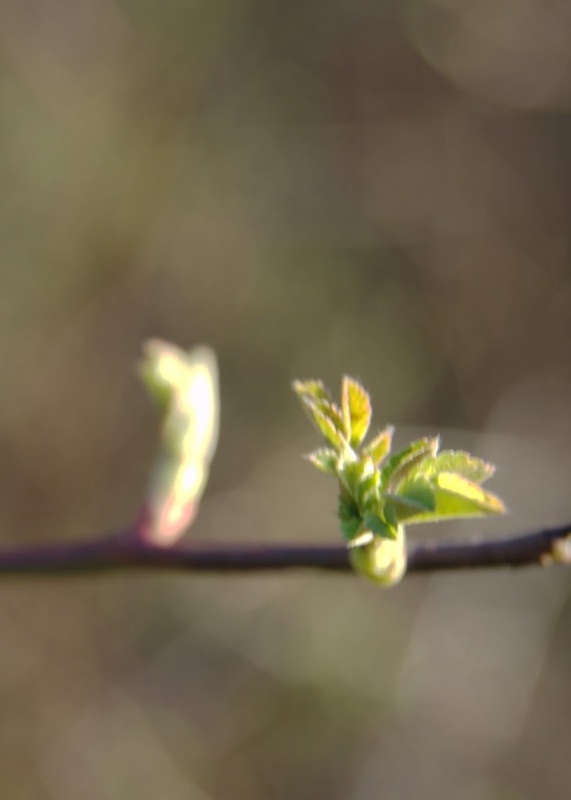 Therefore in some ways I see God’s love shown more in the resurrection than in the crucifixion. In the crucifixion God faces the worst reality of what humanity is; in the resurrection he comes back to stay in relationship with us. No doubt he could have walked away, gone and sat up in heaven away from all the mess that we are making here. He did not, he came back and dwelt once again amongst us. A recent exchange on twitter the Thesiswhisperer wondered about why effects were disappearing as mentioned in this New York Times article. The feeling is this should not happen with the modern scientific culture, and yet I suspect modern academic scientific culture is partly to blame. To explain why I have to introduce a little known but rather simple statistical fact which may be called Regression towards the mean. Let me do it by given a common example used in teaching regression towards the mean. The lecturer tells a class that he has the ability to improve people psychic ability. He then writes on a piece of paper a number between 1 and 100 without showing the class. He then asks the class to write down what they think the number is. He then reveals the number and asks to class to tell him how well they did. Now the experiment starts. He takes a sample from the class of people who got furthest from his value, say the worst half. He points out these are obviously the less psychic to show the effect. With these he performs some ritual, perhaps to stand up turn round three times and say “esn-esn-on” (“nonsense” backwards). Then he repeats the experiment but this time with only this worst half and low and behold, they perform better. That is there average guess is closer to his value than they were in the previous study. The lecturer then admits there is no psychic ability involved in this, so what is going on. The trick is in the selection. Indeed if he looked at the Standard deviation for the whole class at the start and the standard deviation for the sample in the second they should be of approximately the same size. People are pretty randomly choosing their number, those who guess badly at first do that pretty randomly and actually if he had taken the full class the performance would have been much the same as before, only the ones who did better would have differed. Regression to the mean basically means that if there is a selection bias in a distribution as fresh data is produced this will tend to go back towards the mean. So what has this to do with non-repeatability. For starters I am not belittling this phenomena I have been involved in studies which aimed to replicate a previously carried out study. The prior study reported a huge effect so the power calculation required a small sample size, indeed so small we upped the numbers just to persuade the ethics committee that this was a genuine attempt to replicate. This only to find when we have the data collected that there is no effect visible in the data. So I have experienced non-repeatability. Nor am I accusing researchers of bad practice. They are honestly reporting the results they get. It is the ability to report the results, i.e. the selection process by journals that produces the phenomena! Published results and accepted results aren’t just a random sample of all results. They are selected for the results that demonstrate a genuine effect. They particularly like those results that are significant at p=.05 level. However gaining a p-value of less than .05 (or any value) is no guarantee that you have a true effect. For a start off with p=.05, one in twenty of results where there is genuinely no effect get reported as having an effect. Now that isn’t one in twenty of reported results (it might be lots higher or lower) but one in twenty of results where there is NOTHING is genuinely happening. Unfortunately we don’t know where these one in twenty are. It looks like a result even though it there isn’t an effect. We know there are type 1 error, our selection for criteria for publication reports allows one in twenty papers through where there is genuinely no effect. But what if there is an effect? Well we are more likely to detect it if our sample happens to over-estimate the effect than if it under estimates the effect. In other words there are studies out there where there was a genuine effect but it did not get published because they drew a sample that performed badly. On the other hand on well designed experiments all the studies that draw fortunate samples are likely to significant. So the tendency is to over estimate actual effects because the selection criteria for publication favours those who draw fortunate samples. This is not news, I have not suddenly found this inspiration, look there are learned reviews exploring this very topic. There are approaches when results start behaving in this way, one is to look at the sample size it would take to detect a difference between the original results and the fresh results, and if that is larger than the two studies then it may well be just the result of regression to the mean. It is also why clinicians are moving towards Meta Analysis rather than the results from just one study, but meta-analysis itself is hampered by the publishing bias. I also want to sound a warning, skewed data (data where a few people produce very high scores) can quite easily produce odd ball results. This causes problems when sampling, there are statistical methods for analysing this but I have rarely seen them applied out side the statistical class room. So yes I would expect the published results of effects on the whole to be over-estimates. The over-estimation is a product of the current scientific publishing culture. There are some approaches to alleviate this problem but at present no cure because the cure involves a change of culture.